One of the key principles to remember when trying to create a great public square is that the inner square and outer square must work together. Active edges (sidewalk cafes, museums, shops) feed into the center; in turn, a lively scene at the heart of a square creates a buzz that draws more people to the area, generating more activity for edge uses. It's symbiotic! 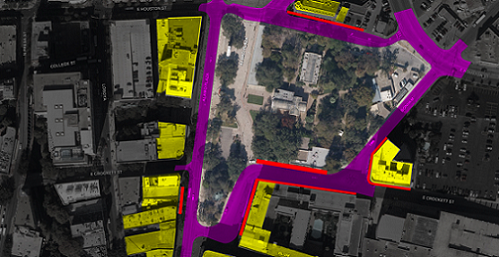 The video above illustrates this principle using imagery from our study of Alamo Plaza in San Antonio, Texas. Home to one of the most iconic buildings in America, the plaza itself is more of a place to stand for a photo op than a place where people linger and enjoy. As you can see, creating a sense of connection and flow between the inner and outer square is key to success.